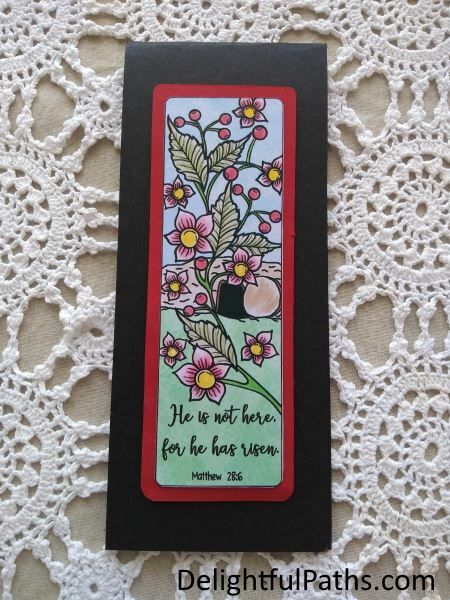 A set of four Bible verse Easter coloring bookmarks with a free coloring page. 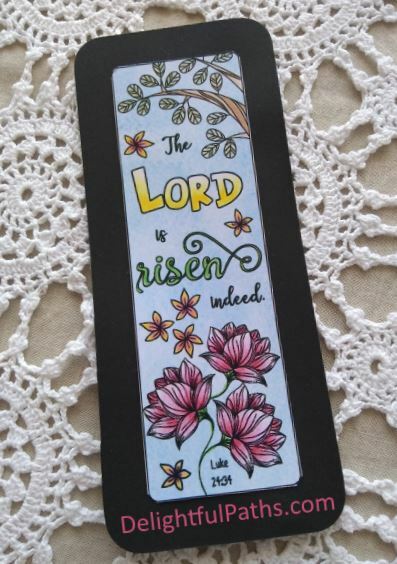 These can be colored and used as bookmarks or made into special Easter cards. A lady I was talking to the other day made a comment about how surprised she was at seeing Easter eggs in the shops already. But when I thought about it, I realized that Easter is only 2 or 3 weeks away! Easter is a special time to really focus on the crucifixion and resurrection of Jesus Christ. 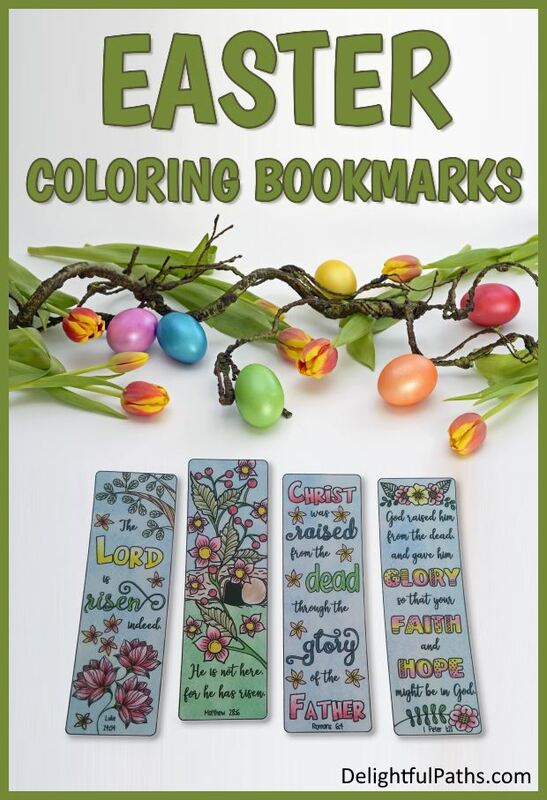 So I decided to create some Easter coloring bookmarks and make them available in my free resource library – if you need the password, you can fill out the form at the bottom of this post. These bookmarks are so easy to make – just color, cut out and voila! Four Easter bookmarks. Okay. These bookmarks are really easy to put together. After you have printed out the coloring page, simply color and cut them out. Mount individual bookmarks on a contrasting piece of card for a sturdier version (like the one shown above). But you can make more than just bookmarks from this coloring page. I colored my four bookmarks with all the same color palette so I could combine them in one project (well – two of them at least!). 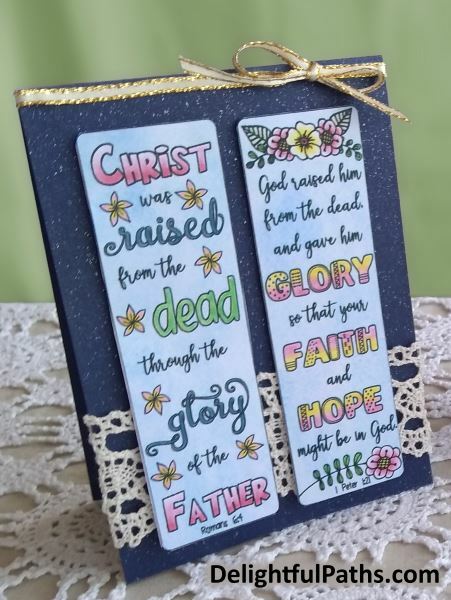 The card below uses two bookmarks and small pieces of lace and ribbon. And I stuck the final bookmark to a piece of red card and then onto a long left-over strip of black card from my stash to make a long, skinny card. Subscribe (free!) 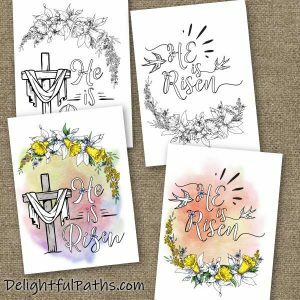 to get access to the Easter bookmarks coloring page (as well as my whole resource library with all my coloring crafts and printables!) Once subscribed, I will send you a semi-regular newsletter with details about my new free files, occasional offers, and other things you may be interested in. 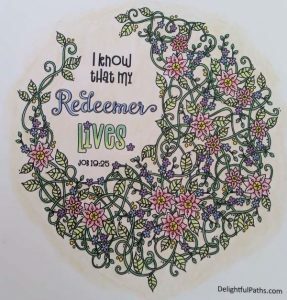 The perfect coloring page for your Easter crafts – My Redeemer Lives Bible verse coloring page with an intricate floral frame from Job 19:25. Could I please get a password? Great resources to use with my students at a Christian school. I appreciate you so much! Please could I have a password so that I am able to access the free Easter bookmarks. I’m having problems with your entering my email into your website. It keeps saying I haven’t got a valid email address. I don’t see a form to fill out at the end of this page. Can I get the password? These look awesome, could I get the password please. Are you having a problem Jennifer? Thank you so much for sharing your artwork with us, my first grade CCD class will love these!